Tasco Tri-Grip reusable ear plugs feature soft, spherically curved flanges that conform to your ear canals, even those that are not perfectly round, for a reliably effective and comfortable fit. Also available in corded. Tasco Tri-Grip Reusable Ear Plugs (NRR 27)4GlenJuly 30, 2016I use ear plugs when riding my motorcycle to combat wind noise and also to lessen damage from lawn mower noise, etc. Have used plugs now for thirty-some years. My favorites have been the Howard Leight Smart Fits. The Tasco's are good at noise reduction but I found the material to be harder and less comfortable and the "handle" sticks out too far and interferes with my helmet. Tasco Tri-Grip Reusable Ear Plugs (NRR 27)5ThomasJuly 14, 2014I use my ear plugs for sleeping. I need an ear plug that eliminates noise (e.g. snoring) and is also very comfortable. These ear plugs are perfect! All noise disappears and comfort is superb due to the soft plastic that conforms to my ear. When I placed my order I selected five different ones so I would be able to select the best of the five. Three of the others were acceptable but were not as good as this one. One of the others was painful in my ear. I suspect we all have different ear canals so it is better to buy several different to assure you have one pair thar meets your needs. Tasco Tri-Grip Reusable Ear Plugs (NRR 27)3jfredenJanuary 12, 2014Arrived timely, too small to work. Very small ear cannel though the youth size would work...don't. Back to foam that forms. 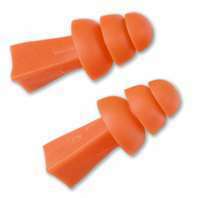 Tasco Tri-Grip Reusable Ear Plugs (NRR 27)2PeterJuly 3, 2013Bought the small (Tri-Grip Junior) for my girls. Although functional, insertion very difficult: insufficient rigidity at the transition between grip & flanges. Far superior are Elvex Quatro.